Take that vacation to lower risk of heart attack and depression, or move near a park for better mental health. Traveling with my family on the beautiful beaches of Negril, Jamaica. I have been saying this for years! Wendi, Connor and Payton at the Rose Hall Plantation in Montego Bay Jamaica. Martin and Wendi enjoying a beautiful day in Jamaica. Kids are snorkeling and having fun while we relax. Everyone is happy! Have You Seen The New Jamaica? Two Hyatt hotels announce their new opening dates and you’re invited to explore them. The openings of Hyatt Zilara Rose Hall and Hyatt Ziva Rose Hall, after an $80+ million renovation of the Ritz-Carlton Rose Hall property, has been pushed back from Nov. 1 to Nov. 23. Hyatt Zilara, with 234 suites, will accommodate adults. Hyatt Ziva, with 387 rooms and suites, will serve couples, groups, and above all, families. Most rooms in these properties in Jamaica have an ocean view. Playa has almost tripled the former Ritz-Carlton’s beach area—there will be swim-out suites, nine restaurants, a staff of more than 1,000, watersports, tennis, a kids’ club, and some innovative firsts. What Makes These All-Inclusives Different? Island Routes personnel will greet arriving guests at the airport, expedite them through Customs, offer them snacks, register them while they’re still at the airport, and get out of the airport in 15 minutes. Yes, 15 minutes. Zilara/Ziva will have exclusive use of a 100-ft. Island Routes catamaran for family, adults-only, and group cruises. Adult guests will get a free round of golf at the legendary White Witch and Cinnamon Hill golf courses; this offer is good through 2015. Carnivore alert: The restaurants will include the first Brazilian churrascaria on a Caribbean island. Other restaurant news: Froemming aims to keep every restaurant open seven days a week. Evening options also include a one-of-a-kind rooftop Moroccan lounge. Moving beyond the farm-to-table trend, Zilara’s beachfront spa will offer a “Table-to-Table” service whereby couples enjoy late afternoon treatments and then step out onto the sand, where they’ll linger over a candlelit dinner for two under the stars. This winter, Zilara and Ziva are offering introductory rates: At Zilara, a 480-sq.-ft. suite with a king bed, fully stocked bar, whirlpool bath, and terrace will range from about $480 to $540 per couple. At Ziva, a 493-sq.-ft. room will cost approximately $450 to $480 per couple, or $616 to $672 for a family of four. Rates include taxes and gratuities, and children under 3 stay free. WOW! What a wonderful show. We met so many neat brides. It is always interesting to hear a wish list for honeymooners and Destination Weddings. We are offering many specials and invite you to call for the details. Don’t forget we have the $100 Gift Certificate offer going on till 8/15/2014. The show was hard work to get set up seeing Launa and I were both out of town with in the 2 weeks before the show. 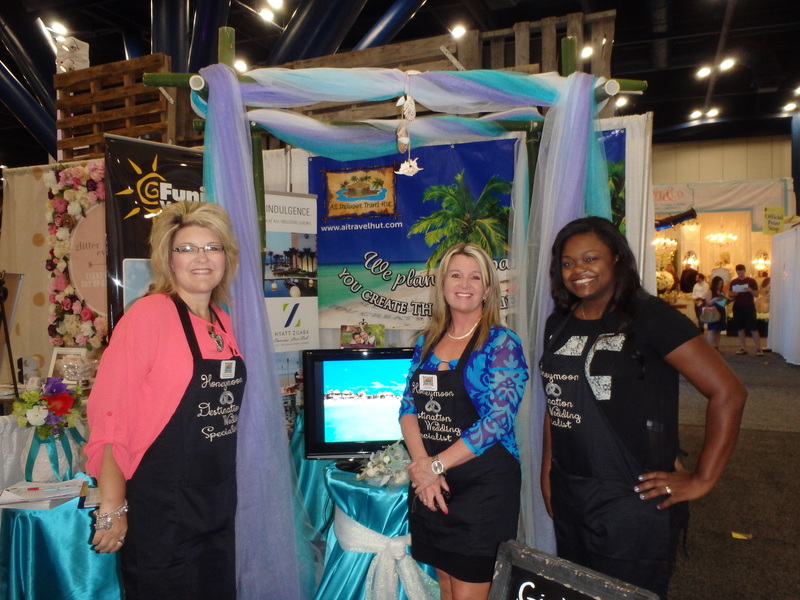 The booth came out great and we are excited to be working with brides and grooms for the perfect honeymoon or destination wedding. One of my favorite things that happened at the show was this. I was talking to a bride and groom about a Destination Wedding. One of the first and most important questions is, “will you have kids attending your wedding?” I don’t know what he was thinking but he responded with, “well they won’t be born yet? We are going to have kids but in a couple of years.” Judging from the look on my face he said, “ok, I don’t think I understood your question?” We had a good laugh and I am now working to get the Destination Wedding of their dreams in motion. We had Valeria from the Karisma Resorts come and help us out a couple of minutes. Brides were instantly amazed at the tropical setting they offer. Thanks to everyone that came by our booth. It was nice to meet so many nice people and to say hi to all the brides, grooms and moms! Do You Need 10 Reasons to Visit the BVI? Cryer Pools & Spas, Inc.